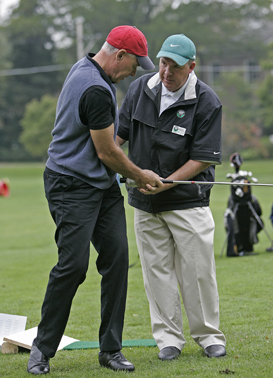 Our Golf Skill Evaluation is the starting point for all instruction. It’s an in-depth discussion between player and coach that helps us understand and respond to your specific goals. We’ll evaluate your swing mechanics and learning style using a variety of teaching aids, techniques and video analysis. You’ll be amazed at the new technology and how it works. Then we can zero in on your strengths and weaknesses. Together we’ll plan a program designed especially for you. We offer three levels of Golf Skill Evaluation from our basic one-hour session to a comprehensive analysis of your full swing, short game and complete goal assessment with Science and Motion's SAM PuttLab, TrackMan and video analysis.